Nolan Arenado of the Colorado Rockies prepares to bat against the Los Angeles Dodgers at Dodger Stadium. Nolan Arenado of the Colorado Rockies notched three base hits against the Texas Rangers Wednesday night, marking the 27th consecutive game in which he rapped out at least one hit. The 27-game hitting streak is now tied for Major League Baseball’s 71st-longest since 1914, the first year Retrosheet’s game log data is available. Arenado is now the proud co-holder (with Michael Cuddyer) of the longest hitting streak in Rockies history. But how does his streak compare to other 27-gamers, in terms of his total batting statistics over the course of the run? 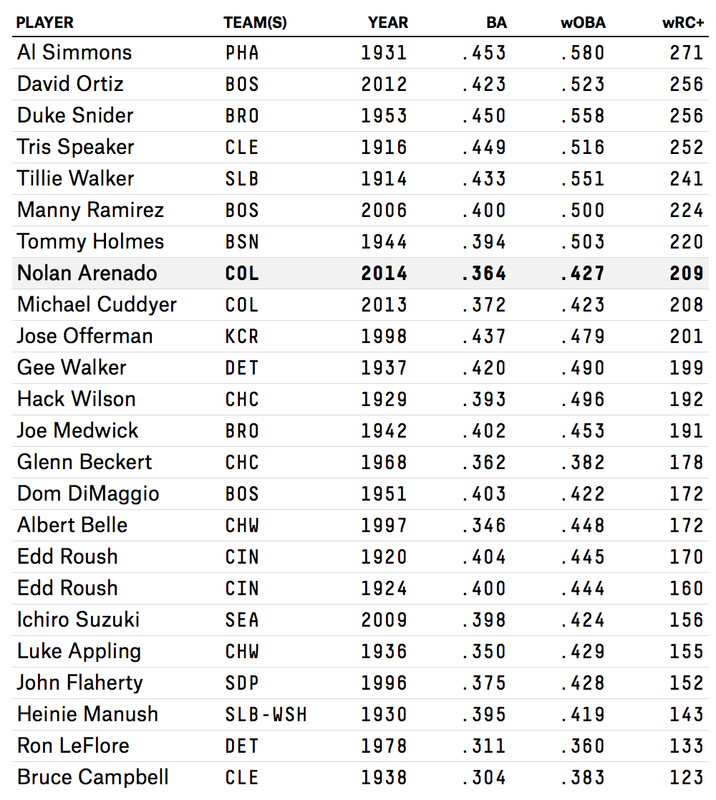 To answer that question, I used Baseball-Reference’s handy streak finder tool to gather all 27-game hitting streaks since 1914. Then I calculated Weighted Runs Created Plus (wRC+) to measure each player’s batting productivity per plate appearance.